I’m just wandering how many people have recently logged onto twitter, seen the blue bar at the top of their screen, read ‘Pssst... the new version of Twitter is here’ and thought ‘oh yea, i’d heard something about that’ and have clicked the try it now button.The new twitter has certainly been a hot talking point, just check #newtwitter. Now my thinking is that Twitter are getting some very accurate live data out of how many people are having a look at the new Twitter, spending a small time playing about THEN reverting back to the old screen. Thinking ‘Phew! Not ready for all that quite yet!’ The simplicity has somewhat been lost, if Twitter users wanted a media integrated service would they just not choose Facebook? The main premise of Twitter is SIMPLE. Just 140 characters of text that’s it. Nothing too complex about all that. Are Twitter trying to fix what isn’t broken? Well no, more realistically they are trying to gain more revenue and this new format is much more conducive for online marketing and brand promotion through the sale of sponsored tweets and advertising. So the future of promoted tweets and advertising by Twitter will be available on all third party apps. This makes perfect marketing sense and will see the rise of a new form of Social Media advertising far surpassing the marketing power of a Facebook ad. Twitter advertising is a great platform to not only spread the word about a new product or service but get an instant response from an immense number of people and begin new conversations. 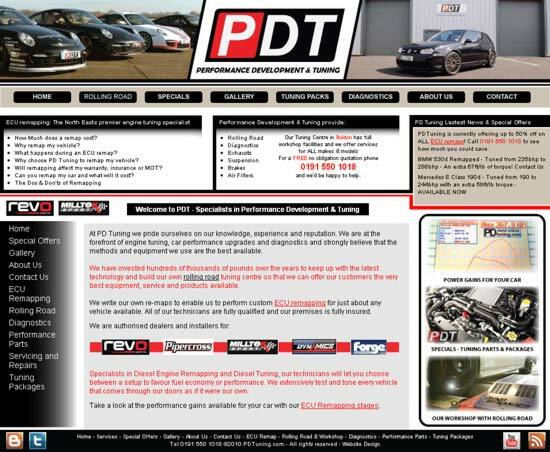 It has been a great pleasure working with David at PD Tuning and helping revamp their old website. 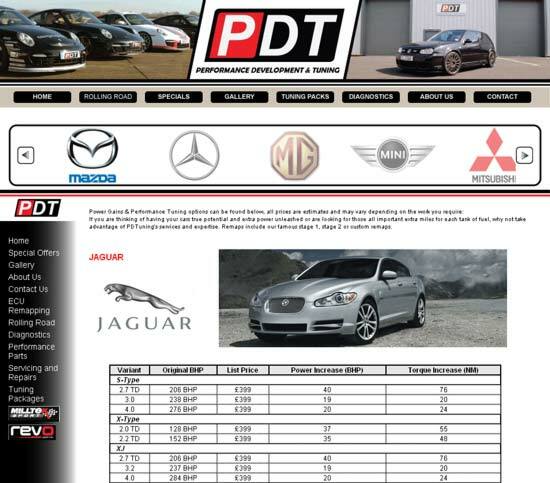 PD Tuning offer high quality Engine tuning and remapping. Specialising in ECU remapping and performance engineering, Performance Development & Tuning are specialists within their field and provide the best available service. After an in depth Consultation we agreed on the following goals to ensure the best website design and seamless web functionality. • Accessible on all browsers, smart phones, iPads etc. We look forward to working with PD Tuning well into the future, building and improving on the current Search Engine Optimisation campaign we have in place to ensure this site receives the amount of traffic it deserves. • 2010 – Google TV launched, Apple TV on the way, internet videos online set to make the TV obsolete. The rapidly changing landscape of the Internet means that web branding of the future will also have to evolve. Web branding shares many similes to Branding of yester year, the firm basics still remain the same: Simplicity, Brand character, a clear Image of values and most importantly a memorable brand that your customers will hold in high esteem and talk about positively. Thanks to all these new innovations listed earlier, each brand, if they carry a high quality online social media and internet marketing campaign are going to get their brand seen a whole lot more, in a great deal many more places. It is apparent that more and more opportunities are opening up for a variety of multi-media web branding. It will not just involve a fancy looking image on a website but will depend on how cleverly the brand can be portrayed in as many different media types as possible. Creativity and Innovation will be crucial to powerful online web branding of the future. The brands that have made a worldwide name for themselves in the past are finding the old laws of branding don’t work. For instance figures from 2009 show that media spending for advertisements in newspapers/ TV was down 30% but up the same amount within the mobile and online markets. Ground breaking, controversial and thought provoking branding campaigns are coming to the forefront. To get a brand noticed within this climate you’ve got to shout very loud and most importantly have a clever message to kick start the social media conversation. A brand can be likened to a personality. A more colourful, vibrant and flamboyant personality will receive much more attention and intrigue. These qualities are important for a brand to gain maximum exposure but other qualities need to be adhered to also. Trust, Loyalty and Admiration, if these key qualities can be well balanced with the eye catching personality traits; a brand has the foundations for true success and notability. For a Brand to get noticed in these times requires thinking outside the box and delivering something fresh. It’s an exciting time for Web Branding and the old rules of paper and TV are no more. With the rise of Social Media everyone’s after the most pioneering and original way to target their customers. It is so easy to reach the wide audiences businesses have always craved for thanks to the potential of the internet. The new problem now is how to grab this audience’s attention and hold onto it. Thinking outside the box is described by some as moving out of your comfort zone to find innovative solutions. This statement is no different when applied to business. Taking risks and treading the path less trodden will sometimes help break barriers to reach a spark of genius. Let’s take a look at some inspired ‘outside the digital box’ ideas of recent time. Forgotten your bank card? No cash? No wallet? Fear not! Well that is if you’ve managed to remember your phone you can take advantage of the forward thinking of www.tabbedout.com. Tabbed Out allows you to first find a pub or restaurant nearby that hosts their service and then simply connect your tab straight to your credit card. Why just have a limited number of words engraved onto your tombstone when you could have your whole life story available for your mourners or just the curious to download. At www.personalrosettastone.com they have come up with an ingenious way of bringing cemeteries into the digital age. A small tablet can be added to the headstone and visitors will be able to learn about the deceased’s life story via a mobile device. I hope you can see from the afore mentioned sites that thinking outside the box can bring into creation some marvellous ideas. Get Thinking! The Internet is changing and so is the way we use it. Only a few years ago watching videos online could be a very frustrating experience. Long download times and poor quality videos when being streamed online made many people think that video wasn’t best suited to the internet. When compared to a TV, it used to be a hands down competition that TV far out performs online videos. The size of the screen and the far superior quality has had the television leading the way, until now. A technology just being rolled out is the introduction of internet TV, Google have just released Google TV and Apple are not far behind. A simple box that will plug into your current TV and then you’ll have the huge multimedia choice the internet can provide. No longer will you be restricted by a limited number of channels or timetabled listings but the ability to watch what you want when you want. Predictions forecast that within three years time, an impressive 90% of all bandwidth used will be for the use of online videos. This isn’t hard to believe as videos are becoming more and more popular, not just for entertainment but as an important business tool. The old adage ‘a picture is worth a thousand words’ is extremely poignant, as then, what’s that make a three minute video worth? Videos are very helpful for businesses trying to sell their products and services. A video that will automatically start playing once you arrive on a website is far better at holding the viewers attention than an image or animated gif. As a visitor you’re eyes are instantly drawn to the video and for this reason it far out performs any standard image based web advert. Videos that just play from start to finish are already seen as ‘passe’, the really interesting and engaging videos focus on user interaction. Some interesting examples out there include an interactive video CV, this video allows you to navigate around the video in a similar way one would navigate a website. Each separate section delves into the selected area of education or expertise, all sections are short videos filmed by the individual in question. Another impressive example found was on a companies website under the about us section. A video shows all the employees standing in front of you, by selecting certain individuals you animate them allowing them to speak and explain their job, likes etc. These new types of user interactive videos are definitely effective and allow the user more choice to feel part of the experience. User engagement is a necessary tool for successful websites of the future. Recent interactive video campaigns of note include Tippex’s ‘Shoot the bear’ video. The user gets to change what the hunter and bear do by entering a verb of choice. An amusing advert that uses human interaction to great benefit. Old Spice also had an extremely lucrative video campaign involving an American football player in various different scenarios, the catch being that all the situations were dreamed up by members of the public. There really are no limits to the possibility of interactive videos, the more original and innovative the better, they also have the potential to revolutionize user reviews and testimonials for all manner of products, experiences and services. An interesting and truly interactive future lies ahead. More and more these days businesses are finding out about the benefits of setting up your business brand through Facebook. It has taken a good while for most modern day companies to come round to the thinking that social media network sites aren’t just a fad but it will definitely help promote online business. A common misconception is that it’s hard to set up your business on Facebook, but this couldn’t be further from the truth. Facebook has an extremely user friendly interface and even if you haven’t used it before it’ll only take a short period of time to get used to it. • Sign up for a free account if you’re not already one of the 100’s of millions using Facebook. • On the left hand side bar of your user profile you will see one of the options is to ‘Add a Page’. You will be asked to specify the type of page you require. Select the Business page option and fill in the required fields such as name and location. 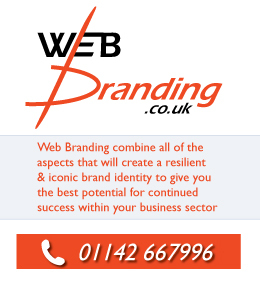 • Now is the time to get your business page looking the part to best represent your business. Facebook provide a checklist of recommended options to get you started. Run through all these as best you can loading a business logo for your profile and linking your page to your website, blog and twitter if you have them. The integration of multiple platforms within the social media sphere is very useful so for example when you make new posts from your new Facebook page, automatic posts will be posted on say your Twitter account. This will maximise your online coverage and ensure more efficient online business promotion. • A good hint for your profile image is to use the dimensions of 200x600px. This size is the maximum size Facebook will allow. Most people only use a small percentage of this. Make sure you all this space as it’s great advertising space for your services and products. Page space is seen as page real estate. The more you’ve got the better. • Make sure you fill in all your tabs at the top of your profile, info, links and add a couple of posts on your wall to get you started linking back to your website, blog etc. • It is possible to add additional tabs at the top of your profile which is extremely useful and good for expressing your business brand. For this you will need to add an application to your page called ‘StaticFBML’. Search for this in the search bar and go to the link. On the ‘StaticFBML’ page there is an option on the left hand bar to ‘Add to my page’ use this. Now return to your page, you now have an additional tab called ‘StaticFBML’ by using edit page option you will be able change the tab’s name to something like ‘Welcome’. StaticFBML allows you to use HTML code to create a fully functional website within this space. For this example I am simply going to create an image by 500x700 and use this as a welcome image. Upload the image onto a folder on your website, blog or similar so you can have a url address pointing to it. • On the profile edit options you are able to specify that visitors to your page will land on your preferred tab. For maximum effect change this to your welcome tab and as soon as a visitor lands on your business page you will have a full page spread promoting your business, your full length profile and welcome screen. These pointers should help your business profile on Facebook and will definitely drive more traffic back to your website. Which Social Media Platform is Best for You and Your Business? With so much choice available within the Social Media arena it is easy to understand how some of us can seem daunted and confused about starting to use social media for the first time. This article will run through the big players within social media to help you learn which type will work best for you. Once you have worked out the best form of social media for you and your business it will give you the opportunity to harness the true potential of social networks and help your business grow. It is worth taking time at this stage to figure which aspect of social media suits you to really see the benefits in the future. The following list includes a current classification of the top social networking sites. • Bebo – started up in 2005, Bebo pulls in a young crowd and its main focus seems to be multimedia – great for sharing video and music. If your target audience are teenagers then this will be a great starting point to get your name into the young domain. • Blogger – a very powerful tool, a blog is becoming the perfect partner for any modern website. Easy to update, post comments, fully interactive, looks professional, minimal fuss and so simple to link back to and help promote you and your business. • Delicious/ Digg/ StumbleUpon – All these services share the same principle of users book marking their favourite sites, links and information. They have less potential use for business promotion but are a good source of noteworthy information and give good feedback on sites. • Facebook – The biggest and probably the most effective social networking site for both personal and business benefit. A great platform on which to reach a wide audience and to promote events, products and services and also an excellent global communication tool. Like blogs, a facebook page is becoming the norm for most businesses these days. • Friendfeed – This will help integrate all your current social networking sites. Check the latest news from your Twitter, Facebook and Google. A convenient way of sorting through different news and information feeds. • LinkedIn – A business only site that requires you to load your education and work details and is a high quality business network of vast proportions with high-value business contact to be made. A must for all business ventures and professional individuals. • MySpace – Predominantly for music and video, many new music talents have been discovered through Myspace, a powerful platform for creative music types but with no space for business networking. A good tool to reach a young crowd. • Picasa/ Flickr – Both sites are used for uploading and sharing pictures. These sites are good for any business that requires artwork or photography. A great social feel to the sharing of creative wares. • Twitter – Definitely one of the ‘big two’ in relation to social networking sites that have most influence. (Twitter and Facebook). A simple yet highly popular format of posts, no more than 140 characters. Share thoughts, interesting information and links. A great opportunity for businesses to re-connect with customers on a more personal level and very easy to use. • You Tube – Last but definitely not least. With faster internet connections being a thing of the norm, videos are a great way to get a message across. You Tube is the second largest search engine! And it’s just for videos. Short videos can be great for business as they are more effective than a screen full of text and will appear in most google searches. Depending on your business sector the list above will help you better understand the pro and cons the wide selection of social networking sites and help you make the right choice. These days more than ever before there is an abundance of free advertising options. There are so many different avenues to go down to help advertise your business many of which are to be found online. The old forms of business advertising like in a newspaper or magazine are of course still as viable but will cost you. Why bother paying for advertising when they’re so many sources for free advertising online. If you’re looking to advertise your business and just starting out so perhaps haven’t got the required funds to spend on business promotion, look no further. Forums – a great place to start, there is a forum for just about any topic you can think of. Find Forums that relate to your business type, sign up for free and get posting. Most will allow you a signature below each post. Turn this into a link back to your site and hey presto a little free advert for your business every time you post a comment. Facebook – Similar to the forum idea, facebook is a great source of free advertising. Simply set up a business page, fill it full of interesting facts about your company, photos, videos, articles and other relevant information. Then promote it yourself, invite friends and get talking about it. Try to search for well established groups with a decent amount of members, preferably something that interests you or is applicable to you business sector and make interesting posts with links back to your business page which will be packed full of decent information promoting your services. Viola more free advertising. Blogs – Your own blog is a perfect platform for writing up promotional pieces on your business. Don’t just be restricted to text, use video, podcasts, images, visual adverts. All these different formats can then be posted to appropriate repositories to maximise the amount of coverage each one gets and remember each one is another potential branch linking back to your website. See these methods of free advertising through different platforms. Send Videos to Utube, metacafe, yahoo videos etc. once again the more the better as each video will link back to your business website thus increasing the amount of visitors back to your site. Send your images to Flickr or Picasso, and be sure to add a good amount of text about your business, with more important links back to your site. Twitter – This powerful resource is a great way to further promote all the above features. Use a simple and attention grabbing title with a link for yet another great mode of free business advertising. A simple comment on others sites and blogs will often mean another valuable link back to your site. Email marketing. Try and put together a well written and appealing email before though so its not seen as instant spam. All you have to do is draw, paint, sing, anything.. about how your dream website will look and get the chance to have the website completely designed and built for FREE. Why not enter and win a website today. A Perfect opportunity for anyone starting up a business and a little short of cash, or perhaps you've got something to shout about and a website would help you do that. Please get creative and join in the Win a website competition. Web Branding is proud to announce our 2010 Website Design Competition. The time is here to put your creative juices to the test and design a homepage for any website of your choice. This web design competition is open to everyone at school or university, whether you’re a skilled graphic designer, someone with a natural eye for good web design, unemployed, sat at home looking after your children, bored on your lunch break..anything..ANYONE..get involved! SIMPLY JUST CREATE A HOME PAGE FOR A WEBSITE..that’s all! The Web Branding Website Design Competition is extremely easy to enter and doesn’t require a lot of your time. Scribbles on the backs of envelopes, a video describing how your website will look, a song!, pictures, paintings, models...absolutely anything you can think of will be warmly welcomed. Think unique, how would your dream website look? These days, online marketing and brand building are big business and it is becoming more and more important to grab your visitor’s attention. This website design competition is all about creating a distinctive, eye grabbing and memorable website homepage. • Think what makes a good website? • What makes you want to stay on this webpage? • What about the website design make you want to click and find out more? • What makes you keep coming back? Web Branding are in the business of online branding and web design and will ensure that the winning entry will be turned into a fully functioning website all property of one lucky winner. Get those creative hats on and try and think if you can design the perfect webpage. All entries for the Web Branding 2010 Website Design Competition and to be sent in before 30th November. Our friends at the ‘Made in Sheffield Magazine’ have also kindly agreed to feature the top 5 entries in the magazine along with a special feature on the winner when the website is built for the winner.